The premise of What Alice Forgot is simple. Alice falls off her spin bike and hits her head. She is knocked unconscious and when she revives, she thinks that she is 29, pregnant, and wildly in love with her husband. She soon discovers that she is 39, the mother of three children and in the middle of a bitter divorce from her husband. My neighbor recommended this book to me and told me the premise. It sounded okay but she really thought it was good. I decided that I would try it based on her recommendation. I reserved it through the library and waited. My turn arrived late last week. This book is so much stronger than I would have imagined. While Alice finds her way through the last 10 years of her life, we are amazed along with her. She is not impressed with what she sees as her life. She is baffled by some of the changes in her relationships with those she thought were closest to her. More than anything else, she has to find things out for herself. No one seems to want to or be able to explain how her life has changed. Mostly she wants to know what happened to her loving relationship with her husband. How did they get to this point where he could be so bitter toward her? And there seems to be a woman named Gina that lived across the street that has had a huge influence on her life but she stumbles in trying to figure out why. I found the book absorbing and interesting. It is not the story that I expected. It is a woman examining her life from a different perspective and trying to see how she evolved. It causes you to wonder what it would feel like to do it yourself. Would I like/understand myself? I found myself rooting for Alice to reconcile with her husband and continue to follow her instincts. I wanted her to have the golden “do over”. I did not realize it when I read this book but I had read another book by Liane Moriaty. I read The Last Anniversary about six months ago. I enjoyed that book also but would not put it in the same category as What Alice Forgot. It was more of a “popcorn” book and I do not feel that way about What Alice Forgot. 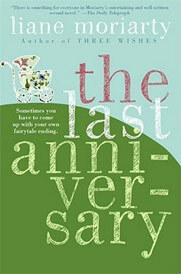 The Last Anniversary would be a good beach read while What Alice Forgot is a “stay up late to see what happens” book. 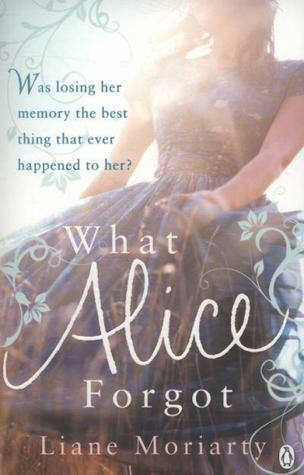 I would say that much to my surprise, What Alice Forgot is the best book I have read lately. I suggest that you give it a chance. I loved this too and couldn’t put it down. A very pro-marriage book that weaves a strong love story. Well, Carol, you got me very interested in this book now. The premise seems full of mystery and surprise. I love the cover. The golden ‘do over,’ can one do that? I’m intrigued. I think you will like it. I was surprised at the viewpoint that was taken. Let me know if you like it. Thanks Carol! This book sounds intriguing! Another one to add to the list! Those lists just grow and grow, don’t they? I hope that you find this one as good as I did!